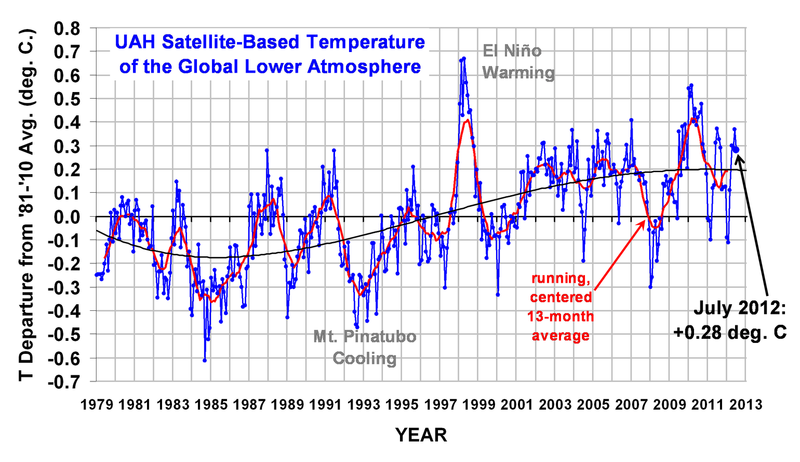 This is another article beating the dogma that CO2 is driving climatic fluctuation. 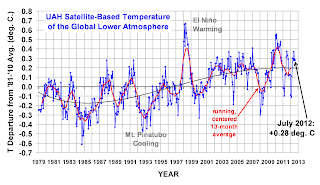 It you look at the chart above, you will observe that for the past decade the climate has been warmer by about .4C degrees. This fits very well with what has been observed. Even better, this chart is calculated by a satellite that is immune form changing local conditions. Unfortunately this decade has a natural comparable to the decade of the thirties when we had similar conditions and temperatures. It also looks like the 1997 El Nino event dumped a lot of heat into the atmosphere that then has taken forever to dissipate. The problem is that we do not have two centuries of date to compare with. I also suspect something significant happened in the Atlantic ocean that we do not yet understand. All this looks very much like part of a natural climatic cycle that is steadily warming since the Little Ice Age. That was possibly triggered by a sharp adjustment in ocean currents which I suspect is the only force able to make the magnitude of changes observed. Otherwise, the economic and scientific reality is that we will need to use fossil fuels for a short while. The good news is that the transition to thermal fusion energy has begun and can itself completely displace fossil fuels. In the meantime gas plants are thrashing the coal industry now and will completely end its role. It thermal fusion is a problem, then we already have superconducting power transmission and this allows western geothermal power to replace all fossil fuels as needed. So before, real fusion energy is available we can do it all using geothermal. It is just that we will not need to do it this way. My point though is that fossil fuels are on their last hurrah. They face a flood of superior replacement. We're not getting any free lunch from the world's economies, either. With only a single year's lull in 2009 at the height of the financial crisis, we've continued to pour record amounts of carbon into the atmosphere, year after year. In late May, the International Energy Agency published its latest figures – CO2 emissions last year rose to 31.6 gigatons, up 3.2 percent from the year before. America had a warm winter and converted more coal-fired power plants to natural gas, so its emissions fell slightly; China kept booming, so its carbon output (which recently surpassed the U.S.) rose 9.3 percent; the Japanese shut down their fleet of nukes post-Fukushima, so their emissions edged up 2.4 percent. "There have been efforts to use more renewable energy and improve energy efficiency," said Corinne Le Quéré, who runs England's Tyndall Centre for Climate Change Research. "But what this shows is that so far the effects have been marginal." In fact, study after study predicts that carbon emissions will keep growing by roughly three percent a year – and at that rate, we'll blow through our 565-gigaton allowance in 16 years, around the time today's preschoolers will be graduating from high school. "The new data provide further evidence that the door to a two-degree trajectory is about to close," said Fatih Birol, the IEA's chief economist. In fact, he continued, "When I look at this data, the trend is perfectly in line with a temperature increase of about six degrees." That's almost 11 degrees Fahrenheit, which would create a planet straight out of science fiction. Far too much to read on a subject that has had its scientific credibility destroyed.. I'm afraid Australia HASN'T seen global warming in action, even with the Lamestream media trying to blame every weather change on it. So the Northern hemisphere is having a hot summer.. big deal! We have just come out of a 10year drought, so call us in nine years. It appears you have forgotten your freezing winters from only a couple of years ago. Ths is called natural variation you know.